80 Halifax Road, Todmorden - available in 2mm, 3mm and 4mm scales. Remember, you can 'try before you buy' with the FREE download facility, so you are buying with total confidence. All credit card transactions are handled by Barclays Bank on their secure server; or you can use your PayPal account. 'Try-before-you-buy' FREE Model Railway Building Kit! One of the joys of the model railway hobby is finding subject material crying out to be modelled. 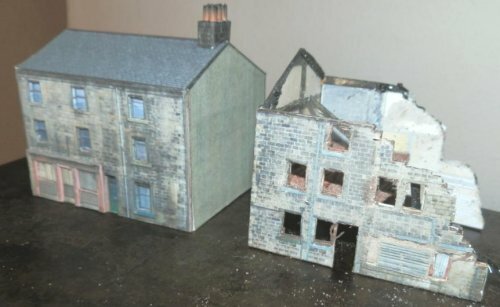 And Todmorden has some particularly rich pickings as Geoff Taylor has demonstrated with his models of the Queen Hotel and St. Mary's church. It always pays to have your camera handy, and never waste an opportunity. And so it was when my wife detoured into the Health Centre on Halifax Road leaving me in the car. There are some nice looking shop frontages along the northern side of Halifax Road, including Border Books (interesting local history books in the window), which I thought I would snap. Only for reasons unknown, when the site was cleared for Lidle and the Health Centre, two proprieties were left standing in splendid isolation. 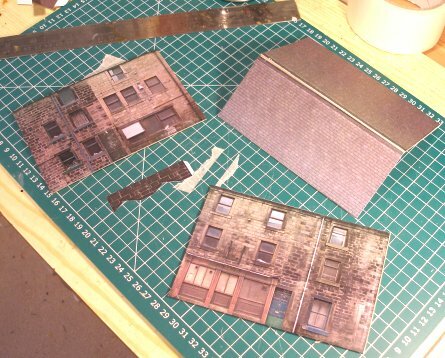 A number of modellers have created their own card kits in the style of Bilteezi using photographs. This is a good way of creating a lot of 'colour' quickly, but often its difficult to find a building that all four sides are easily accessible (and without trespassing or with bushes and trees in the way!). I took a set of snaps for later study, and realised as well as the obvious large bush in the back yard, the cars parked around it in the Health Centre car park took a while to remove using PaintShopPro. Having spent a very enjoyable hour taking them out, I had a 'blinding flash of the obvious', which was to pop back on Sunday morning when the Health Centre was closed, and the car park empty... Result! What I particularly liked about these two properties was the dated exteriors and faded paintwork, so easily 'backdated' to the 1960s. They were part of a terrace, and the northern gable wall has been rendered, but the southern wall appears to have been faced in stone, with two modern fire exits cut through the wall, one being accessed from a modern external staircase. This seemed a very neat and self-contained building - just a perfect shape and size to either create a half-relief building from or replicate them to form a street scene. I am therefore happy to share this with fellow modellers of the northern scene, and have created a set of artworks - currently in 4mm only - which can be downloaded free of charge. My only request is that should anyone ever ask, you will tell them about this site. And then they too can have a free building kit. 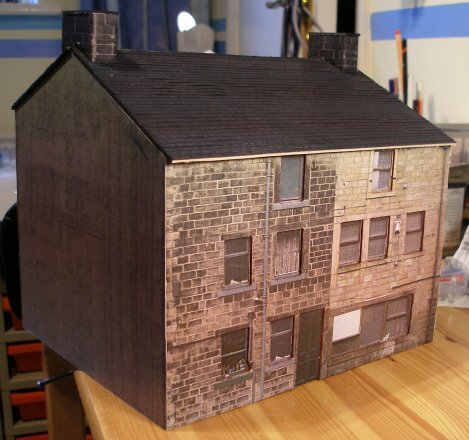 Start by downloading the 4mm Halifax Road shop & house kit here. You will be asked to download a Adobe Acrobat PDF file - do remember to save it on your hard-drive! 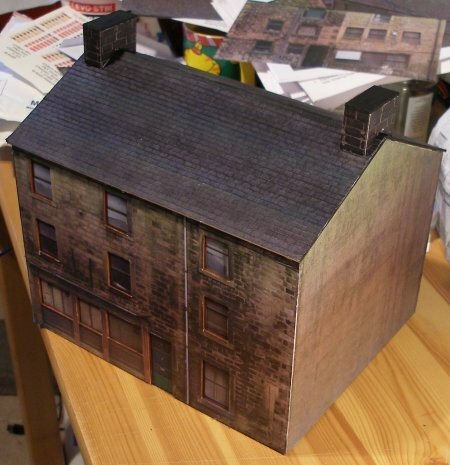 You will find you have four sheets, which include a front and a back; three sides (I know this doesn't add up), plus two roof sections and four chimney stacks. The front and back are obvious. 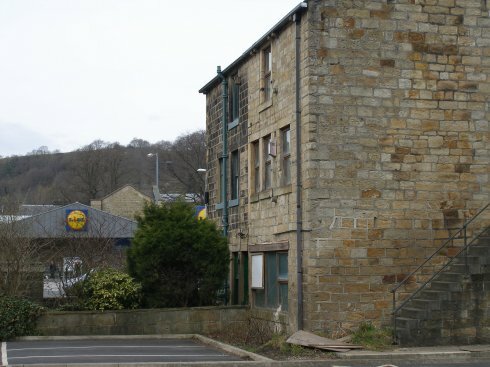 As you will see from the accompanying prototype photos, the southern-end gable (the Halifax-end of the building) has a modern stone facing, with two fire-exits, with accompanying steps it (if you view this in Google Streetview, there's a man carrying boxes down the stairs!). This looked oddly out of place on a building which otherwise has a very careworn appearance, so there's a choice: either make the building with the rendered north-facing gable mirrored at the south-end, or build it as it appears now in 2013. The extra part is there so you can decide. There are two ways of making this kit. 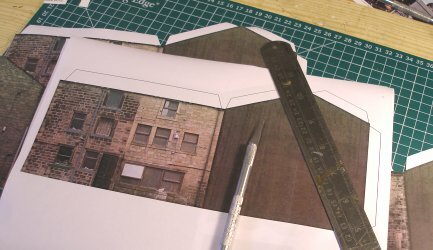 You can either print it out on thick paper or light card - depending on what your printer can handle - and build it rather like the brilliant Bilteezi kits - which are still available through Jerry Freestone. This would give you a rather flimsy building, but would be a quick corner-filler. With regard to printers, there are some choices. For good quality home printing, I use a Canon inkjet. This produces great quality but runs through cartridges at a rate of knots. I have been using refills from Smart Cartridge in Chesham. With the old cartridges taken back, this works out at about £5 a refill - and there are six cartridges! But this is still expensive, and recent I found a Hewlett Packard Laserjet on eBay for £11 half-way through its design life, although it has cost £80 to buy a set of laser toner. This is more cost effective, but the colours are more subdued, and ideally images should be centred as there is distinct fading towards the edges. Also with Inkjets, items printed can fade - they become white in appearance. The answer seems to be to spray them with varnish after printing, although I have subsequently discovered that those that have 'faded' can be rescued with a coat of varnish, so the colours are still there, you just cannot see them! Another option is take the PDFs down to your local print shop on a Memory Stick and get them printed out on their industrial-grade printer: I use Orbitpress in Chesham who are very tolerant of my strange and varied requests. For those who'd like to do something a little more special, here's how to do it! I've used the laserprinter, as this recipe requires three copies of each sheet. We are going to create three layers, with the first layer featuring the glazing; the second layer the glazing bars and doors; and the third layer the walls. Take the first set of sheets for the front and rear walls only, and cut out each wall section to the final finished size, taking off the tabs which are not required. I use Permanent Spraymount, so spray the back of the two fronts and two sides - leave for a minute or so - and then gentle affix to a piece of mounting board, making sure to smooth it down with a cloth, and watch for the glue oozing out around the sides. If this does get on the finished artwork, use lighter fuel or similar to clean it off. Once dry, spray the windows areas with a gloss spray - I use car lacquer, as it's only £12 for a large can. With all the Spraymount and laquer, a well ventilated space is a must. 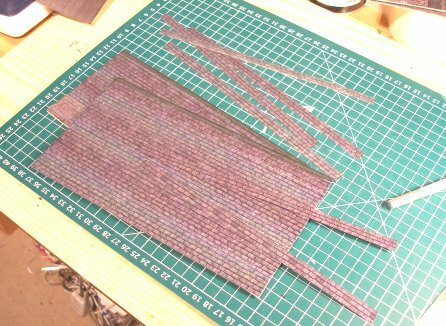 Next, take your second set of sheets, apply the Spraymount, but this time affix them to thinner card - I use cereal packets. When dry, with a new scalpel blade, and cut out the glass from the window frames. Ditto the doors. Now glue this card to the first layer with the varnished windows. 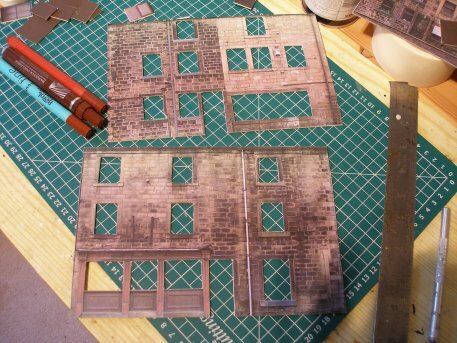 Finally, repeat with the third set of sheets but this time, after mounting on the thicker board, you are cutting out the windows and doors to leave just the stonework. Now stick this to the previous two layers. Placing the completed walls under a handy brick for 24-hours would be a good idea. 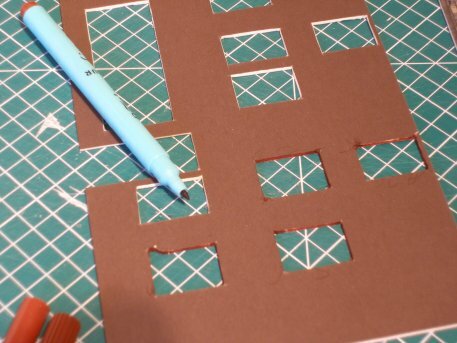 The end walls are now also affixed to mounting board, but leave about 3mm overhanging each side so that the card is hidden when the walls are glued together. The roof panels are now also mounted on card. I would suggest a set of interior walls also be cut and fitted, using the end walls as a part template (they will have to be narrower). Glue the four walls together, and the interior strengthening walls, and the two roof panels. The front roof is narrower than the rear roof. There are four chimney stacks: the prototype only has one which is about a foot in from the edge of the roof. Fold this together, and strengthen with card. Add a piece of card to the top to hold the chimney pots, and paint is dark grey. Add chimney pots to taste - the prototype has two. 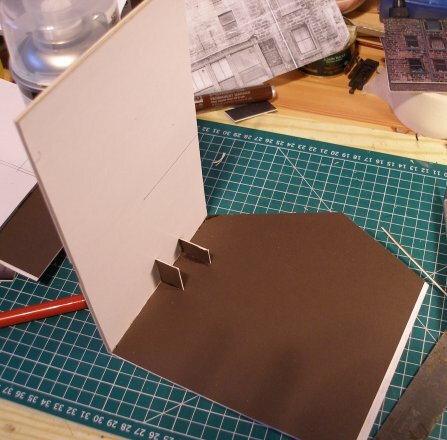 You could also glue a floor to the bottom of the building, as this will ensure the sides are held rigid. 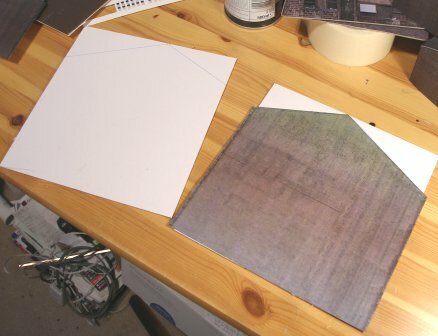 With regard to roofing, my own preference is for the Howard Scenics slate sheet HSB47, which are the ones used in the Howard Scenics house kit HSK41. Despite what it says on the Freestone site, these are slates and not tiles. Jerry also has a stock of the old MerCo series which is a rather darker, and slightly greenish grey which Jerry reckons works well as slates. Printed on thin paper, and with quite subtle lines on its printing, if used in strips in the same way as the Howard Scenics sheets, it would be good for a Lakeland or West Country slate effect. The product is now out of production, but Jerry reckoned at the end of 2012 he had adequate stocks to last some considerable time into the future. And whilst on the subject of roofing, there are two types of slate roof in Todmorden: roofs are either classic Welsh dark grey or use local brown stone, which creates a much bigger and thicker slate. For the record, I have used the slated roof from the British Legion building just below Station Approach, and rather appropriately, snapped from Platform 1 on Todmorden Station. Despite its obvious newness, the ridge tiles appear rather badly laid. See what others have done: Take a look at how N-scaler Jerry Howlett built the model as intended and then also produced a partially demolished version. Click the link and scroll down the page to Reply #40 dated January 08, 2014, or check Jerry's photos below. 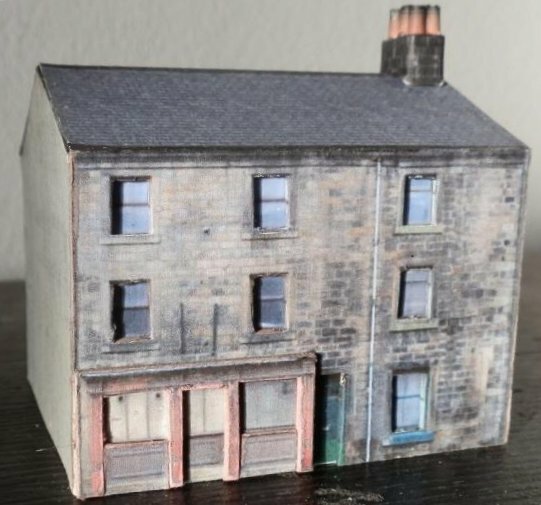 Prototype notes: According to Roger Birch in his 'Todmorden Album 5: Shops' the shop was originally occupied by W L Lumb & Co, electrical retailers. Will Lumb started his enterprise at 82 Halifax Road (opposite the Hippodrome) in 1926. 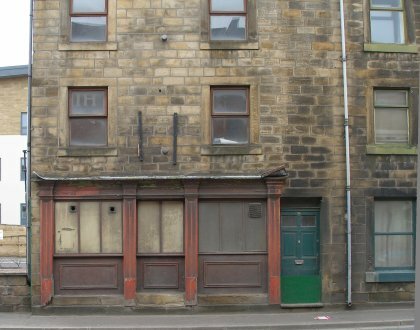 Winning a sweepstake allowed him to open a second shop in Market Street, Hebden Bridge, and in 1933 he vacated 82 for a corner spot further up the road. Whilst at 82, in 1931, the Lumb's launched the subscription service 'Radio Relay'. I am grateful to Peter Dawson for providing further notes on No. 80. Peter writes: "My Grandfather Dawson's painting and decorating business was in number 82 and my father and his sister would have lived there prior to their marriages. In later years my aunty moved back with her family and ran the shop for some time. Father worked for Granddad as a painter and decorator for many years and no doubt was the person that painted the 'faded paintwork'. It did look nice at one time! I've quite a few happy memories playing with my cousins in their playroom at no. 82. Number 80 was the home of Mr and Mrs Taylor, a really nice old couple. Why the two properties were left standing when houses on each side were demolished no one knows. Maybe they are listed buildings that eventually the National Trust will acquire and affix a plaque stating that Peter Dawson once played here; ...or maybe not! I had no idea that W.L. Lumb occupied the property. I remember them being at the corner of Halifax Road and Union Street South as they sold Hornby Dublo items. Little did Jim Greenwood, the manager know what a long lasting effect he'd have on my life, and finances. I think that Charlie Lumb was W.L. 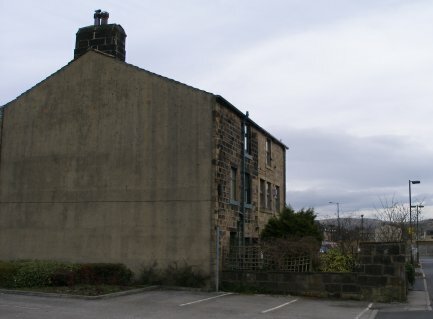 's brother and he ran his own electrical shop in the last property before the present police station at 'Patmos' in Burnley Road." Peter has subsequently advised: "My aunty says she knew WL Lumb occupied the shop prior to Grandad as her father once pointed out that a large stain on the shop floor was caused by battery acid. WL Lumb ran an accumulator charging service. Apparently radios in those days were powered by lead acid batteries. The good old days. Imagine one of those in an iphone! The front door on your photograph is no. 80. The boarded up centre section of the shop front was originally the door of no.82. Going round to the back views of the model only one door is showing as is the Google Earth view. The rear ground floor window area is now different. In Grandfather's day we entered his rear door and turned left into a long narrow kitchen, where the white board is. However that doesn’t spoil your superb model of the building’s current condition."